Between years 2000-2008, in 5 projects, it was made the Astorgas Monumental area paving. It was supplied 10.000 square meters of 5 cms thickness Silvestre Sayago bush-hammered tiles in several sizes. 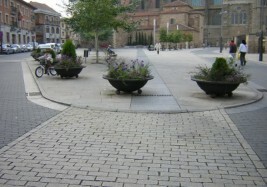 It was also supplied 1.100 square meters of 20x10x8 half-sawn paving sets.